I mistakenly called it Jack bean when I first saw this beautiful vine. It's an easy-to-grow annual. Judy and I included a few seeds in our Holiday Greetings cards several years ago. I hope that at least some of those recipients gave it a try. I make it the subject of this week's newsletter for two reasons. First, it's about time to collect the pretty black and white seeds to save for next year's planting. Also, the first person to write about and give this plant some press (about 200 years ago) was Thomas Jefferson at Monticello in Virginia. 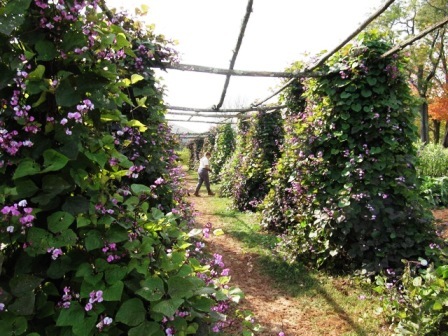 The shot above is the hyacinth bean vine growing in Thomas Jefferson's garden. More about our recent visit to those gardens in the next newsletter. Products are also available in the Dirt Doctor's Corner of your favorite Garden Center. To discuss this newsletter or any other topic, tune in 8am -11am CST to the Dirt Doctor Radio Show. The call-in phone number is 1-866-444-3478. Listen on the internet or click here to find a station in your area. Please share this newsletter with everyone in your address book and all your friends on Facebook and Twitter to help me spread the word on organics.